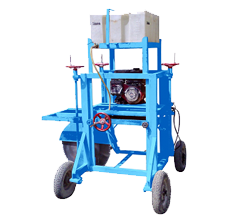 WALIA KERB CUTTER MACHINE Powered by Electric Motor or Petrol Engine Capable of Maximum Depth cut 250 mm, water Spray Attachment, 100 Ltr. Capacity Water tank, Depth Adjustment by Easy Screw with 1 no. of Diamond Blade (size 5 mm x 600 mm), Weight for the Machine 220 Kgs Machine Dimension 1500 x 1450 x 2000 mm. PP-200 E 150 kG 250 MM 6 MM 600 MM Electric Motor 7.5 H.P 100 Ltr. PP-200 190 KG 250 MM 6 MM 600 MM Petrol Engine 5.0 HP 100 Ltr.